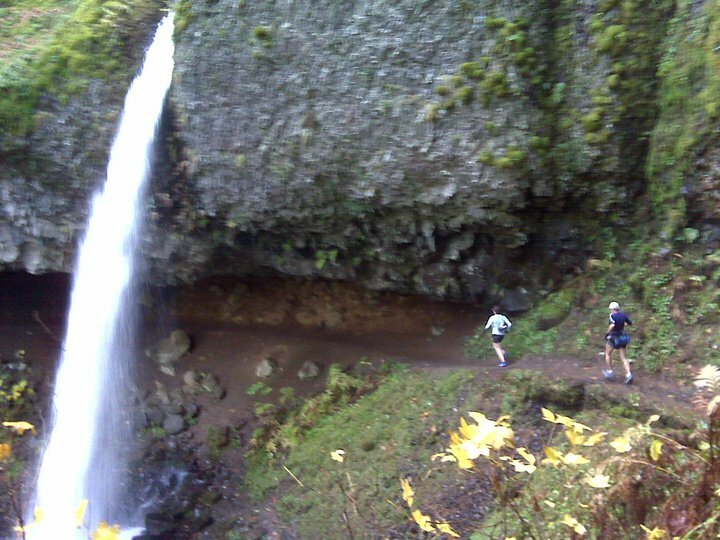 It's been a couple busy weeks since the 2012 Gorge Waterfalls 50k so I figure I better get a report/recap up on the blog before it gets buried in the "to do" list. I tried writing one about a week ago and then mistakenly hit some button on my computer and lost everything...I didn't have the energy to start again. This is my second attempt! Cassie Scallon and I went out to the gorge and did a little recon (see video) about a week or two before the race (although I run out there pretty often) so I felt comfortable about the nature of this course. With the dumps of snowfall the route was rearranged a little taking out some of the high points but all in all RD James Varner did a really good job and we still had some really decent climbs and beautiful views/trails throughout the run. Great energy from the start...The silver lining in James Varner getting a flat tire and the start time being delayed for about a half hour was that friends were able to connect and catch up. I mingled w/ Jeff Browning, Ian Sharman, Max King, Jace Ives, Laura Kantor, Jason Leman, and made some new friends that picked my brain about Bighorn 100. It was a beautiful morning and I was excited to run on my home turf! As is seems with all the races lately it went off like a track meet. Even as we climbed Wahkeena Falls abruptly 1000 feet up and more a pack of runners pushed the pace. Front runners included Max King, Seth Swanson, Erik Skaggs, myself, Ian Sharman, Nick Triolo and I could look down to see Jace, Browning, Leman, Zach, Jenn, Stephanie, etc. etc. After our first major descent I was able to catch Skaggs and we caught up for a few miles and the miles clicked by through a somewhat technical section of trail 400. The lush green ferns hung low over the trail at times making it even more of a dance through the woods. I asked Erik if I could scoot on by and I pushed the pace through the road section fighting a nasty headwind. After the turnaround point I realized that I wasn't more than a couple minutes back of the two leaders and I continued to push the pace. I could tell that I was putting a gap on Erik and the rest of the chase pack and it was nice to see many friends and familiar faces on the out-and-back portion. I gave some words of encouragement to a few peeps including Stephen Petretto and Jason Leman and let the wind hit my sails on the return road back to our last major climbs of the day. As we climbed and climbed around miles 24-26-ish I could tell I was losing power and occasionally I would see a blue-shirted Erik Skaggs lurking behind. I was never able to bury him and being the stellar climber that he is I watched him reel me in slowly and surely. He passed me eventually on a section that Nick and I dubbed "bonk hill" (named for our sometimes slog-of-a-return from Larch Mountain summit). I thought maybe I could catch him on the descent and flats back to the finish line and came very close (maybe within 15-20 seconds) but once we hit a little uphill trail Erik put in another surge and lost me. Real good job to everyone out there. Max took the "W" for the men about 10 minutes ahead and Stephanie Howe took it down for the ladies. We had a really nice spread of food afterwards and enjoyed each others company for hours after the race welcoming people in to Benson State Park Recreation Area. I must say it was nice being home for a late lunch and waking up in my own bed. Oh and running behind waterfalls in one of the most beautiful places in the country wasn't too bad, either! Congratulations everyone and thank you Rainshadow Running (James Varner and Candice Burt) and to all the volunteers!!!! !